My Mom, Elaine Perkins died this morning at 7:AM at her home in New Port Richey, Florida. I would like to share with you some wonderful things about my Mom. When I was five years old back in the early 50’s, Mom would sing to opera and classical music records while washing clothes and ironing clothes in our dining room. Our dining room and living room were connected and I would play on the floor with my hundreds of cowboys, Indians and Army soldiers. At the same time, Mom would be singing from her huge library of songs. Her beautiful songs, helping me feel secure. I used to have a little green station wagon peddle car. It resembled a Plymouth station wagon my Dad drove at the time. As I was peddling down the sidewalk on Clifton Park Ave in Evergreen Park, IL, I could look back and see my Mom watching me out the upstairs window. Even when I went around the corner out of view, I always felt my Mom could see me. I think all Moms have a special kind of vision when it comes to their children. Mom always wanted us to have more than she had growing up during the Great Depression. We never had a great deal of money but all of our Christmas’s were fun and we always received everything we wanted. Mom was involved in Cub Scouts for me and Brownies and Girl Scouts for my sisters. I remember a Cuberee event out in a huge forest where all of the scout troops were decked out in original Native American dress. Even though I thought I was will hid in the thick forest, it didn’t take long for my Mom to find me and bring me back to the scout camp. She always had a sixth sense of finding me. I guess that is just indicative of the bond between Mother and Son. Rest in peace, Mom. You get to sleep late today. Here is a performance I know you will enjoy. She loved to sing classical pieces in their original languages and had mastered Latin for the religious songs. One of her favorites was this version of Ave Maria as sung by the late Perry Como. Do you get tired of watching the news and hearing about all of the gloom and doom in the world? Do you feel you have something important or helpful to say? Now is the best time to create and market your book, e-books, or other e-content to the world. Click here or on the url below to find out how you can get published and marketed now! "My mission in life is to help you achieve your mission in life"
In celebration of St David's Day, March 1,2009 I am offering a 50% discount on all of my hypnosis and stress annihilation products listed here. The sale will end on March 7. Your discount will be calculated after clicking on the order link or the credit card image located here. 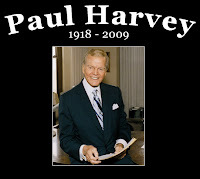 Today, March 1, 2009, I read in Yahoo News, that radio legend, Paul Harvey died. The first time I heard him was in 1963. I had just turned 16 and was driving my black and white dodge to school at Dundee High School, in Illinois. I remember I was about a block away when he came on the air and was telling one of his famous stories. I drove around school about four or five times because of the story he made so interesting through his unique style and captivating voice. Thank you so much Paul Harvey, for all the stories I heard from you for over a half century, both living in the Chicagoland as well as Arizona where you made both of your homes. I even worked for your Arizona Biltmore neighbors, the Rhode’s for many years. Thanks again, and to you Paul Harvey….Good Day!